How many times have you mistakenly deleted the wrong version of a Word document, a folder full of photos from your last holidays or a PowerPoint that you had to present in class the following day? Sometimes you've probably been lucky enough to find the file in question in the Recycling Bing, but on other occasions, you simply can't find the files you've deleted. Recover documents, files and photos you thought you had lost. Thank god that for such purpose we can resort to programs like Recuva with which we can recover from our PC any lost or accidentally deleted files, whether on our local hard drives or any other removable unit, such as external memories, USB sticks, photo cameras or memory cards. How to use it to recover our files? Developed by the guys behind CCleanr, its aspect and functionality are very similar to those of the booster and clear. Simply install the program, choose the folder or unit, and hit the Scan button. 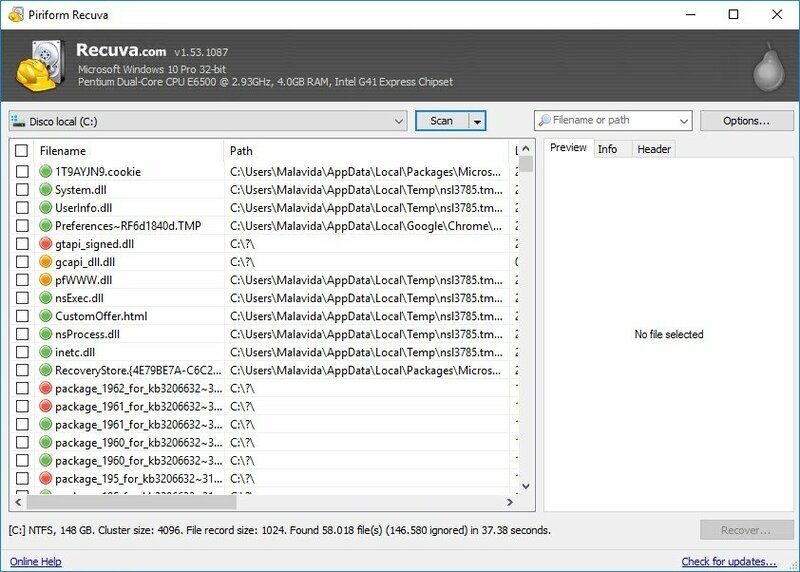 The application will show us a list of all the recoverable files, including photos, documents, executables and other files that we've probably never seen before. 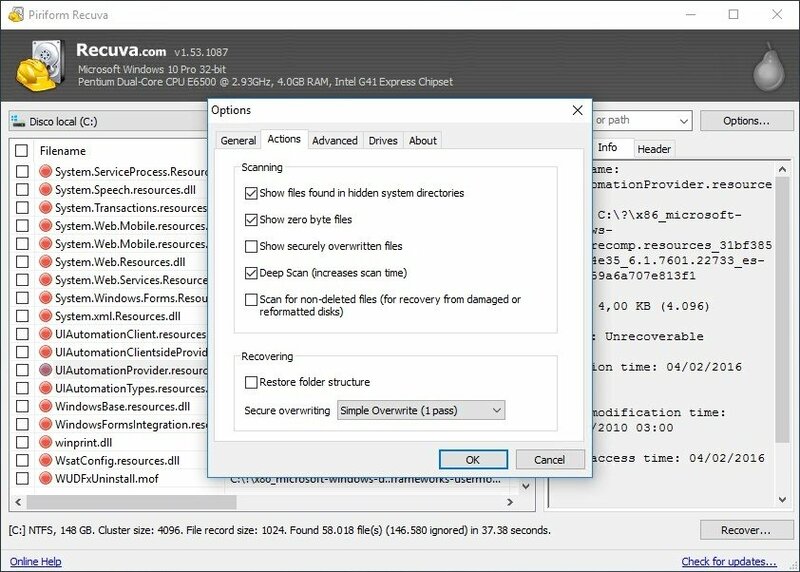 Just browse the list and select the file or files you want to recover (you've got the chance to operate over the files individually or in batches) and click on the Recover button to return them to their original location. Not only can you use it to recover, but also to delete permanentlyu. And how long does it take to recover my photos or files? Well, the recovery process is carried out almost instantly. What takes longer is the scanning of the location where the files have been lost or deleted, and that amount of time will obviously depend on the size of the folder and the number of documents thereby contained. Recover files deleted accidentally from hard drives, removable units or cameras. 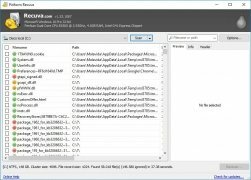 List of files found together with their preview and level of recoverability. Sort the results by name, file size, modification date or path. Color code that indicates the probability of success when it comes to recovering: green, orange or red. Possibility to scan our storage units in depth. Option to save the list of recoverable files as a TXT. 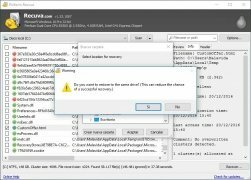 Permanent deletion of files by overwriting them. Which one's better? 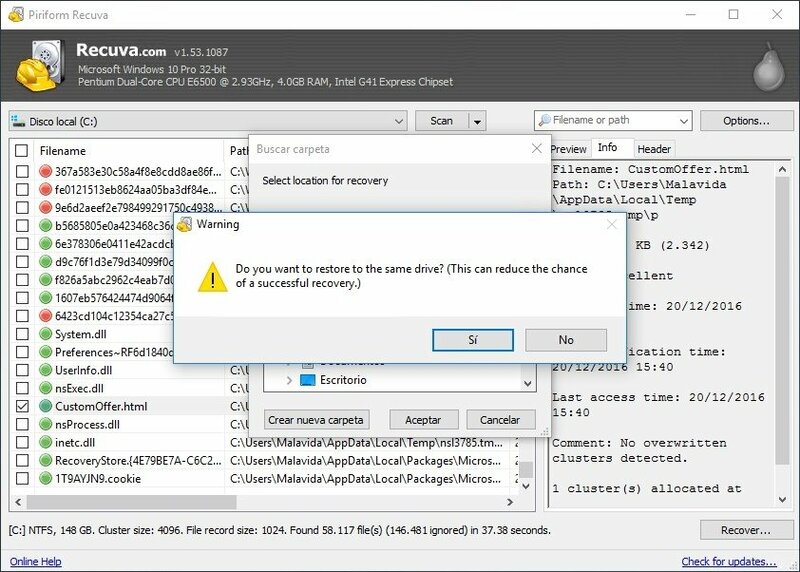 Recuva or EasyRecovery? As you've probably imagined, this program isn't the only software of its nature or with these features. There are many other alternatives out there to recover files from our PC: Panda Recovery, Wondershare Data Recovery or Get Data Back. But the most comparable application, due to its feature and options, is definitely Ontrack's EasyRecovery. Recover your files with support from Piriform. And you logically want to know which is the most recommendable option for your PC. The truth is that both programs are very similar and at the end of the day, the fulfill their purpose of bringing our files back to life. 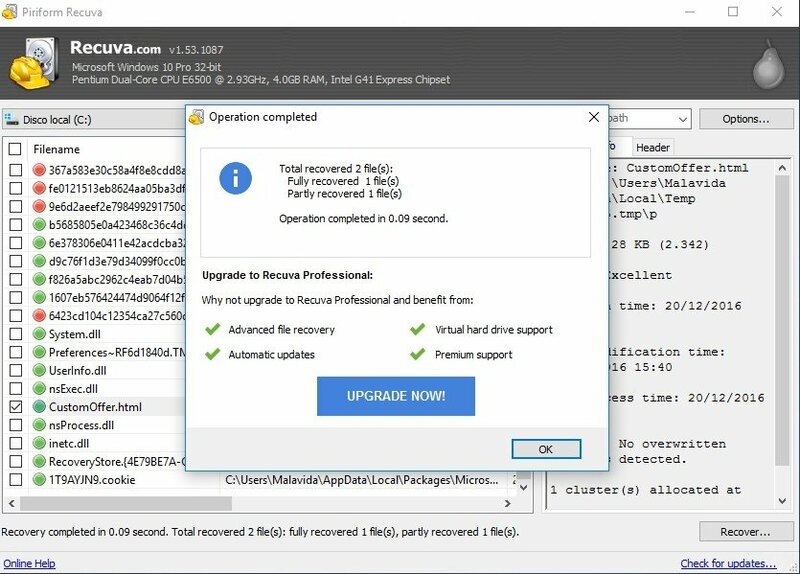 But Recuva has a few advantages over its rival. 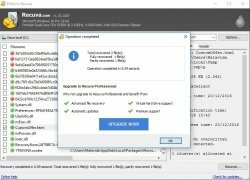 On the one hand, it's backed by the experience of the developers at Piriform, very used to dealing with all sorts of computer problems, and on the other, it's totally free whilst EasyRecovery only offers us a 30-day trial version. 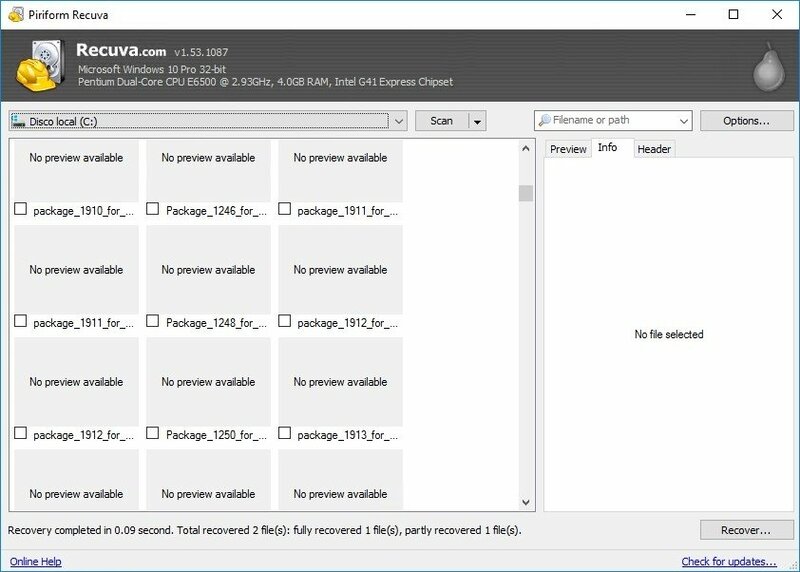 Is there a Recuva for Android? Due to this program's usefulness, the users of other platforms are constantly searching for a Mac or Android version to recover their files on these systems. Unfortunately, there's no kind of DMG or PKG file for Apple's operating system, despite the fact that many developers try to offer software with similar features. 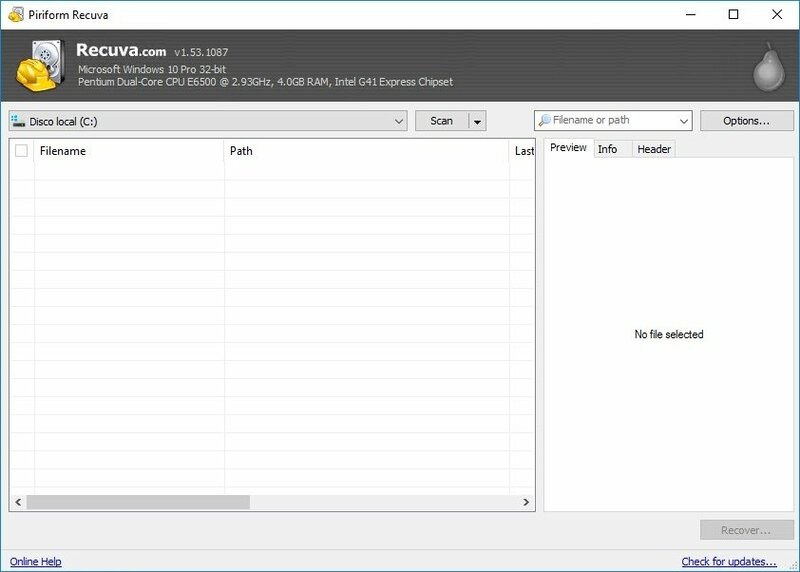 There's no official APK to be installed on smartphones or tablets, but you can also go for the option of connecting your mobile device straight to your computer, enabling the USB Debugging mode so that Windows recognizes it as just another removable unit. From there on, you can scan your phone looking for lost files as if it were a folder on your computer. RePicvid Free Photo Recovery is another reliable software. It could recover deleted/lost photos (completely free), videos, audio files from PC and other storage devices. You can know more at https://www.gihosoft.com/free-photo-recovery.html.